Do you know about the illegal dumping of industrial waste at Teshima (Kagawa Prefecture) into the Seto Inland Sea? Irregular dumping continued until 1990, despite requests from hospitals about hazardous industrial waste in 1975, as well as an opposition campaign and crackdown by residents. Residents and citizens developed an exercise calling for removal of waste with the support of Mr. Kohei Nakabo’s defense team and finally concluded mediation of pollution with Kagawa Prefecture in 2000. Removal and treatment for detoxification in Naoshima began in 2003. And in March 2017 the last waste shipping departed Teshima, the activities of residents and citizens who continued for 42 years came to a break. 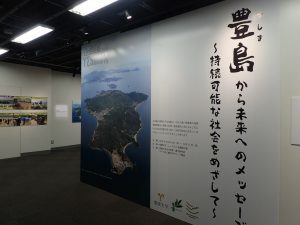 ”Teshima Exhibition” was held in Takamatsu City in July 2017 and Toshima Ward in Tokyo in November, and from October 24 to December 17, 2018, Ehime University Law and Literature Department participated in the sponsorship, and it was held at the Ehime University’s Museum Planning Exhibition Room. 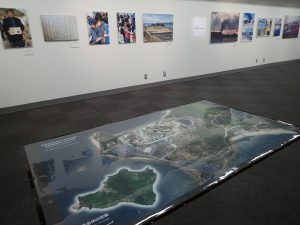 On November 24th, in honor of the exhibition, a symposium “Rich Island and Ocean to the Next Generation” was held to celebrate the exhibition. In addition to reviewing the Toyoshima incident, there was a panel discussion about the world efforts and research reports on microplastic. The existence of microplastic and the influence on the environment are transmitted, and the recognition of the garbage problem as a matter to be confronted without waiting is increasing. Regarding marine garbage, the scale of the world is immeasurable, and it is necessary to continue the endless control of occurrence and removal of existing garbage. 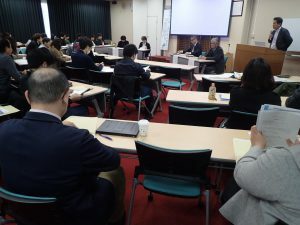 However, as citizens who have been facing the Toshima Incident have opened up the road of solution, it is important to strengthen the thought that “it is important not to never give up, to collaborate and deal with various stakeholders.” Based on the findings of Toshima, it is hoped that activities and cooperation with Ehime University can happen so that efforts can be disseminated from Shikoku, which is surrounded by the sea and that people receive many benefits from. For Teshima industrial waste disposal, please refer to the dedicated site created by the Olive Foundation. Based on the Basic Environmental Law, the Basic Environmental Plan sets out the outline of comprehensive and long-term measures concerning the government’s environmental conservation. The fifth Environmental Environment Basic Plan received the report of the Central Environment Council in April, 2018, and was approved by the Cabinet. In the content, the following priority strategies across the field are written. 1. Building a green economic system that realizes sustainable production and consumption. 2. Improvement of value as stock of the country. 3. Creating a sustainable community utilizing regional resources. 4. Realization of a healthy and prosperous life. 5. Development and dissemination of technologies supporting sustainability. 6. Exhibit Japan’s leadership through international contribution and build strategic partnership. Among them, we propose a new idea of “regional cycle symbiotic zone” that maximizes the vitality of the region. It has been shown that each region will form an independent and decentralized society while promoting efforts to complement and support resources according to local characteristics. We also received this trend in Shikoku, and in 2017 we found organizations involved in Forest-Village-River-Sea Cooperation within Shikoku. We held a meeting for sharing issues and organized the activities of each group in October and the “Forest-Village-River-Sea Collaboration Case Study in Shikoku District” was issued. In Shikoku, efforts related to various watershed cooperation are being carried out. In the future, in keeping with the idea of “Regional cycle symbiotic area” indicated in the Fifth Environmental Basic Plan, we are going to expand our network to tackle this theme together. Forest-Village-River-Sea Collaboration Case Study Collection is the following. In the Shiina area located in the direction of Tokushima from Muroto Cape Muroto City in Kochi Prefecture, there is an aquarium that utilized the elementary school which was discontinued at the end of March 2006. It is a specific nonprofit corporation Japan Sea Turtle Council (head office: Hirakata City, Osaka). Since 2001, that is continuing the investigation of sea turtles hanging on stationary nets with the cooperation of fishermen from these three areas (Takaoka, Mitsui, Shiina). According to the survey, it is said that the past in the Pacific has overturned the hypothesis that there was no sea turtle in winter and has also led to the understanding of the actual condition of sea turtles. 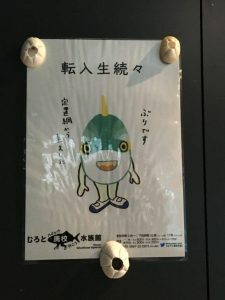 In April 2018, the “Muroto abandoned school aquarium” we opened in order to let people know the accumulation of such activities and lead to regional promotion. This aquarium can utilize the existing facilities of the school and introduce new facilities, you can realize the richness of the sea creatures seen from this abandoned school. 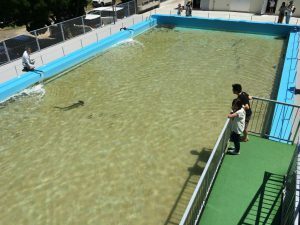 For example, sharks, mackerels, sea turtles and the like swim in the outdoor swimming pool where children in the area used to swim, and mackerel swimming flocking swarming from the school building and the immediate point of the pool, and you can enjoy the appearance of turtles swimming as they wish. The hand washroom in the school building is a touching pool and observing sea cucumbers and conch shells, etc. It is popular not only for children but also for adults. In the aquarium lining the corridor, colorful fish, other than crucibles, shrimp Ise shrimp, gonzui, octopus, crucifer, etc., convey the richness of living creatures of Muroto’s sea. There is a large circular pool in the center of the classroom, and sardines, turtles, and rays are swimming. The characteristic feature of this aquarium is that commentary on each living thing is written with very easy-to-understand words. For example, the information (in Japanese and English) about a beautiful colored fish eats stuff that is unpleasant in the water tank such as sea anemones and chilies produced, so it plays a role of a cleaner in the aquarium. A new fish to the aquarium is introduced as “transfer student”, and visitors will feel like a guardian on the visiting day to see the sea creatures as students. What is worth paying attention to is the contents of the digestive tract of sea turtles exhibited in the science room. You can see that a lot of plastics and micro plastics which were thought to have been used for various purposes were swallowed, and you can imagen the situation of garbage floating in the sea. The Japanese Sea Turtle Council, which operates the “Muroto Abandoned School Aquarium,” used the word “abandoned school” as the name of this aquarium, because the fact that schools that they visited during the lecture have become discontinued. The phrase “abandoned school” is being used on a daily basis in Japan, and the voices and smiles of children are overflowing in abandoned schools. It is said that the thought that it leads to revitalization is put in it. This initiative focuses on SDGs numbers 14 (maintain the richness of the sea), 4 (high quality education), 11 (town development that can continue living), 17 (accomplishment by partnership) and see further investigations. It is related to 12 (responsibility to create, responsibility to use). “Mutonobi Abandoned School Aquarium” including such 40,000 visitors for one year. There are about 4,200 out of 6,800 public schools being utilized in the whole country that have been discontinued between FY2002 and FY2007. Attention is drawn to ingenuity as a base where the area revitalization and smiles overflow.